I also have a deaf Aussie - her name is Maeve, I got her from a rescue at 4 mos. I can't believe someone just abandoned her. When animal control picked her up and took her to the shelter they were going to put her down because they didn't think she was adoptable. Luckily an Aussie/Border Collie rescue saved her. She's amazing; so smart and loving. She already knows 12 hand signals/commands so they really are easy to train. She knows no different, and she takes cues from her Border Collie 'sister' Sophie. I got them from the same rescue at the same time and don't regret it for a single minute. Enjoy your pup - deaf or not, they are incredible pups! We also have two Aussie's. Bailee Joy, our female mini-Aussie is a blue-eyed, blue merle. She is 18" tall and weights 30lbs at 21 months. Maggie Mae, our female toy-Aussie is a brown-eyed, black tri. She is 13" tall and weights 21 lbs at 21 weeks. The "girls" have the same father and were born two weeks apart. Like all people with Aussies - we love our babies. I he a double merl, ours has a shorter coat. Your aussie is beautiful, but there is no such thing as an ugly aussie. WOW !! He is gorgeous. He looks more like a border collie with his shorter coat. My Aussies have longer coats, but he is just beautiful! 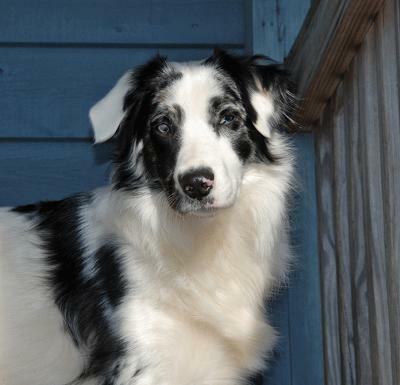 We have a blue-eyed, blue merle female and a black tri female - both 10 months.